Celtics guard Terry Rozier swats the shot of Sixers center Joel Embiid during the second quarter. BOSTON – Here are my main takeaways and best and worst awards from the 76ers' 105-87 loss to the Celtics in Tuesday night's season opener at TD Garden. – Joel Embiid needs at least one knockdown shooter with him in the starting lineup. Bringing JJ Redick off the bench is not helping him. It's obvious that the Sixers are going to make that change at some point, because Embiid needs Redick on the floor more. – This kind of goes with the first observation: Ben Simmons and Markelle Fultz cannot play together. Neither of them is a shooter. The Celtics basically sagged on defense whenever those guys were on the floor together. – TJ McConnell's 22 minutes, 26 seconds of action were not enough against the Celtics. When playing extended minutes, the reserve point guard has dominated Boston. The Celts usually have a tough time stopping him from getting to the basket and are unable to match his intensity when he's in rhythm. – Six seasons into "The Process," the Sixers are still careless with the basketball. That shouldn't be. The team no longer is a tanking squad loaded with fringe players. Yet the Sixers keep trying to play catch with invisible players. – The Sixers' new defensive look is still a work in progress. Weeks ago, the team said Embiid would be stationed close to the basket while the other four players would guard the three-point line. However, Boston was able to take advantage of mismatches with Embiid defending guards on the perimeter after switches. He's no good to the Sixers that far from the basket. – Best performance: Simmons gets this even on a night when his team lost by 18 points. The point guard finished with 19 points on 7-for-14 shooting. He also had 15 rebounds, eight assists, four steals, two blocks and three turnovers in 42 minutes, 45 seconds. – Worst performance: This was a tough one, but I had to give this to Fultz. He scored five points on 2-for-7 shooting. Defenders disregarded him unless he was in the paint. The 2017 first overall pick also was a game-worst minus-16, meaning the Sixers were outscored by 16 points when he was on the floor. The Sixers basically abandoned ship on him in the second half. He played only 3:13 in the third quarter and none in the fourth. – Best defensive performance: You have to give this to Al Horford. The Boston center blocked five shots. Three were against Embiid. All four of Horford's rebounds came on the defensive end. – Worst statistic: This goes to the Sixers' making just 5 of 26 three-pointers, 19.2 percent. They were back to chucking and missing long-range shots. – Best statistic: Horford's five blocks. – Worst of the worst: This has to go to Embiid for getting his shot blocked four times. 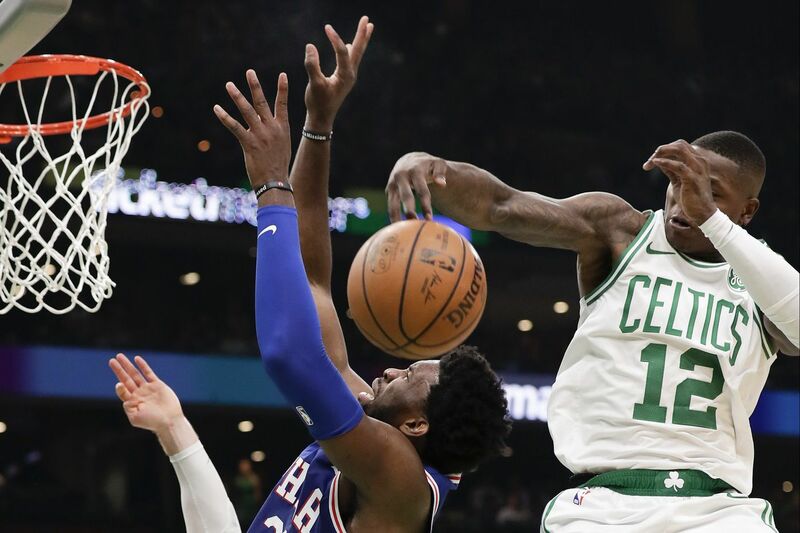 Perhaps the most surprising one came when 6-foot-1 reserve point guard Terry Rozier swatted the 7-foot-2 Embiid's shot.